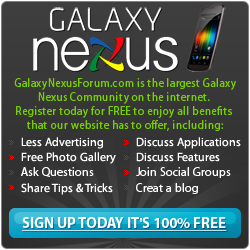 Below you will find a list of discussions in the Galaxy Nexus FAQ & Guides forums at the Galaxy Nexus Forum - Samsung Galaxy Nexus Community. The Galaxy Nexus FAQ & Guides forum is for discussion of: This section contains the Galaxy Nexus FAQ which are Frequently Asked Questions, Answers, Galaxy Nexus How-To's, and Galaxy Nexus Tips and Guides. How to Transfer Pictures Samsung to Mi MIX2s? Do I need WiFi when flashing a new ROM or updating an existing? Can I flash a Sprint Nexus and make it a Verizon Nexus? How to get rid of the "GOOGLE" on top of screen! !